1. I missed the premiere, and when I tried to pick up the series a few episodes in, I felt like I’d already missed too much. 2. I missed an episode during the season, and I knew I’d never be able to figure out what happened, so I just decided to wait for the DVD. Yeah, it’s true: “Damages” is that kind of show…and I should know, having been one of the people who missed the premiere. But when I got the Season 1 DVD set, I blew threw it as quickly as my schedule allowed. It was an enthralling thriller which managed to be that rare breed of legal drama which almost never set foot in a courtroom, with gripping performances from Glenn Close, Ted Danson, Rose Byrne, and Željko Ivanek and many a moment that left you breathless. In the end, Ellen Parsons (Byrne) went through hell and back, leading her to declare war on Patty Hewes (Close) by teaming with the FBI to bring her down from the inside, all the while maintaining a front and pretending to be her number-one employee. Season 2 begins in approximately the same chronological manner as Season 1, starting in the present with a jarring opening scene, then jumping back in time to begin the process of explaining how things got to that point in the first place. How odd it feels, though, for the initial flashback scene to show Patty Hewes making an appearance on “Live with Regis and Kelly.” Not that we haven’t gotten the impression that Patty’s a major public figure in the world of law, but it feels rather jarring to see her in the comparatively day-glo lights of the “Live” stage. Still, you can also imagine it setting Patty up for a big fall when she waves Ellen onto the stage and declares to the studio audience and the millions of viewers watching at home that she’d be lost without her. Ellen’s got her own problems, though. She’s in therapy, ostensibly trying to deal with everything that happened to her last season, but she isn’t making much of an attempt at letting it work; while she’s in her group session, listening to the others vent about their issues, she’s got a revenge fantasy working in her brain which involves her taking a shotgun to Arthur Frobisher (Danson). She’s also found a cute and sympathetic ear within her therapy group in the form of Wes Krulik (Timothy Olyphant), but whether or not anything will come of it remains to be seen. Similarly, Patty hasn’t jumped back into the courtroom since defeating Frobisher, so she’s clearly having some issues with the way things went down herself, though in typical fashion, she’s choosing not to acknowledge them. (She’s sure having a tasty series of bad dreams, though.) She’s got other things to keep her busy, including a battle with a senator over a charitable contribution that he’s promised to make to a new foundation but is trying to wiggle out of, but her associate, Tom Shayes (Tate Donovan), is needling her to get back out there and try a case. When she gets a call from an old acquaintance (energy consultant Daniel Purcell, played by Close’s former “Big Chill” co-star, William Hurt), however, it looks as though Patty might have been given an offer that she can’t refuse. You know, I sense you’re getting a little twitchy. Let me guess: you want to know about Frobisher himself. Specifically, you’re wondering if he’s alive or dead. Unfortunately, the producers want you to keep wondering. This is a photo from Season 1. Repeat: this is a photo from Season *1*. When FX held a panel for the return of “Damages” during the summer TCA tour, Mr. Danson was in attendance, but neither he nor anyone else on the panel would commit to whether or not he was appearing in the new season in flashback or if Frobisher had survived the shooting at the end of Season 1. When I received the screener for the first two episodes of Season 2, it was accompanied by a note which threatened to cut off two of my fingers – one for each season – if I revealed Frobisher’s fate. 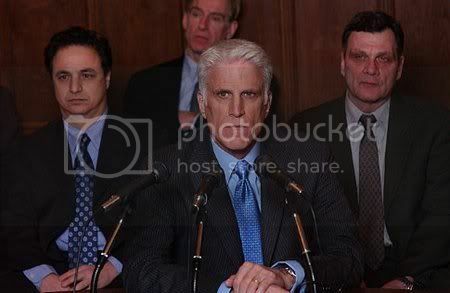 And if you go to the FX media website, you will find that, although there are a few episodic shots for Season 2, there is not a one which features Mr. Danson. Given that I like the symmetry of having five fingers on each hand, I won’t break FX’s embargo on the information, but I will ask you this: if Arthur Frobisher appears in the new season, and we know that he does in some capacity, then is it possible that there’s some reason why they aren’t offering up any pictures to trumpet that fact? Oh, sure, it’s possible. Anything’s possible. You never know what could happen…or who could turn up…and I can’t wait to discuss it all with you after you’ve seen the premiere, which airs on Jan. 7 at 10 PM. There’s a lot of good stuff, but it’s stuff that you need to experience for yourself. Hi, I feel that it is a good show but the only problem I have is the diabolical bonsai in Patti`s office it makes me cringe it is the worst example of Bonsai I have ever seen.